YouGov have some polling for the Times on attitudes to terrorism and Syria following the attack on Paris. The full results are here, and the Times’s write up is here. There are two important findings in there. One is attitudes towards Syrian refugees. Back in September YouGov found 36% thought we should accept more Syrian refugees, 24% keep the numbers about the same, 27% that we should admit fewer or none. That support has dropped sharply, now only 20% think Britain should accept more (down 16), 24% the same number (no change), 49% fewer or none (up 22). It would be wrong to assume this is necessarily connected to the attack upon Paris. The previous poll was conducted at the start of September, a week after the photos of the body of Aylan Kurdi washed up on the beach and amid sympathetic media coverage of refugees trudging across Hungary seeking a route to Germany. At the time there was evidence that the public had become more favourable towards the idea of accepting more Syrian refugees. However time has passed, the media coverage of sinking boats and desperate refugees has faded away again, and I expect a significant chunk of the change in public opinion is because of that – some heartbreaking photos and coverage did provoke a temporary change in opinion, but it was only temporary. The other interesting finding is on sending British and US troops back into Iraq to fight Islamic State/ISIS. 43% of people now support sending in ground troops, 37% of people are opposed. The change since the last time YouGov asked is barely significant, but it’s part of a longer and much more clearer trend. 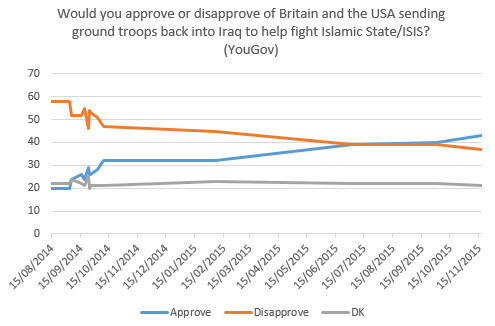 Back in August 2014 when YouGov started asking this question the British public were strongly opposed to sending troops back into Iraq, but since then opinion has steadily moved in favour of intervention. We are now at the point where there are significantly more people in favour than opposed. On other matters, the monthly ICM poll for the Guardian came out yesterday, with topline voting intention figures of CON 39%, LAB 33%, LDEM 7%, UKIP 12%, GRN 3% (tabs here. Their weekly EU referendum poll has figures of REMAIN 43%, LEAVE 38%. Survation have also put out some new figures, voting intentions are CON 37%, LAB 30%, LDEM 6%, UKIP 16%, GRN 3% and EU referendum intentions are REMAIN 42%, LEAVE 40% (tabs here. YouGov’s poll for the Sun on Sunday asked about tactical voting (it didn’t actually use the term, as I think many people use it to refer to different things. It asked if people were voting for their first choice, or a different party that would beat a party they disliked from winning). 77% of people said they were voting for their first choice, 11% tactically. A word of warning about interpreting this – 8% of Tory voters said they were voting tactically, 11% of Labour voters, 12% of Lib Dem voters, 11% of UKIP voters… but we don’t know if that means 8% of Tory voters are voting Tory for tactical reasons, or that 8% of would-be Tory voters are actually going to vote for someone else for tactical reasons (or a mixture). The YouGov Sunday Times poll had a number of questions on British Muslims and on terrorism. People were split over how well integrated British Muslims are into British society and the extent to which they share British values. 46% of people think the majority or almost all British Muslims share British values, 46% of people think that only a minority or hardly any British Muslims share British values. 42% of people think that most or the majority of British Muslims are well integrated, 50% think a minority or hardly any are. UKIP voter’s attitudes towards British Muslims are far more negative than supporters of other parties – 73% of UKIP supporters say most Muslims don’t share British values, 79% say most British Muslims aren’t well integrated. Nigel Farage’s comments about areas of Britain being like ghettos with sharia law were rejected by most respondents – 33% though they were broadly true, 41% thought they were false. 75% of UKIP’s own supporters believed them. There was a particularly interesting immigration question in the Sun on Sunday poll, essentially asking people to choose between a multicultural approach and an integrationist approach. Slightly to my surprise a multicultural approach was the more popular – 36% thought it better that immigrants leave their own cultures and traditions behind and integrate fully into British culture, 48% thought it better than immigrants retain and celebrate some of their own cultures and traditions. Going back to the terrorism and surveillance questions in the Sunday Times poll, just over half of respondents (52%) thought that the security services do need more access to the public’s communications in order to fight terrorism, 31% thought they already have all the access they need. A similar proportion (53%) would support requiring internet and phone companies to retain users data for 12 months and provide it to the security services on request, though by 51% to 35% people think accessing someone’s personal communications should require the consent of the Home Secretary. While people think accessing personal communications data should require the consent of the Home Secretary, when asked whether they trust the authorities to use the information they obtain responsibly they actually trust Ministers & the Home Office less than the police and the intelligence services. 50% trust the police to use the information responsibly, 63% the intelligence services, 45% the Home Office, Ministers and civil servants. In the ComRes poll they asked (via my old favourite the agree/disagree statement, grr!) whether people agreed with the statement that “Ed Miliband is using the issue of the NHS for his political advantage, not because he cares about it”. 49% of people agree, 26% disagree. That looks bad, but I have my doubts about questions about politicians’ motives. I suspect they largely just reflect a general cynicism towards the motives of all politicians, rather than opinions about particular politicians or decisions. YouGov asked a very similar question in their Sun on Sunday poll, but asked it about Ed Miliband AND David Cameron, and got answers that were almost the same. 46% thought Ed Miliband was using the NHS for political gain, 19% doing what he thought was best for it, 20% both equally. 48% thought David Cameron was using the NHS for political gain, 15% doing what he thought best for it, 19% both equally. As you’d expect, in both cases supports of the Conservative and Labour party both thought their own leader was doing what was best, but the opposing leader was just using it for political reasons. The debate over the debates rolls on, and so do poll questions about it. Opinium asked about whether particular leaders should be invited – 61% think the leader of UKIP should, 46% the leader of the Greens, 30% the leader of the SNP, 23% the leader of Plaid Cymru. The current proposals for debates between Con, Lab, Lib Dem and UKIP leaders was supported by 37% of people, opposed by 31%. YouGov in the Sun on Sunday asked people to pick from some possible combinations. The most popular individual option was the widest, the Lib, Lab, Con, UKIP, Green and the SNP and Plaid. This was picked by 35% though, so while it was the most popular single option, 49% favoured a narrower option – 20% favoured the proposed Con, Lab, LD & UKIP, 17% Con, Lab, LD, UKIP and the Greens (but not the two nationalists). 12% supported an even narrower option, excluding UKIP. In their Sunday Times poll YouGov found people still think David Cameron should take part even without Natalie Bennett – if she is excluded 31% think Cameron should refuse to take part, 52% think he should take part anyway. However, asking about the other side of the deadlock, if Cameron refuses to take part without Bennett 52% think the broadcasters should call his bluff and invite her, 28% think the debates should go ahead without him, 8% think the debates should be cancelled. This week’s YouGov/Sunday Times poll is out here. Topline figures are CON 32%, LAB 32%, LDEM 7%, UKIP 18%, GRN 6%. YouGov’s average for UKIP this week has been running at only been 14%, so the 18% here looks unusually high – it could be an effect of the the events in Paris, or could just be a random blip. Part of the rest of the poll addressed the attack on Charlie Hebdo – of course, these figures need to be seen in that context and people’s opinions may very be different in circumstances that are not so emotionally charged (it’s an issue I’ve sometimes commented on about polling about the death penalty – people only commission polls on the death penalty when there is a particularly heinous murder in the news, so polls are always influenced by a particular event). Looking at the polling, a strong majority of people think the press should be free to criticise, mock and ridicule religion, but even in the current context a sizeable minority disagree. Around a quarter of people think the media should not be allowed to mock or ridicule religious beliefs or figures, 18% think the media should not even be allowed to criticise or question religion. More specifically, 69% of people think it was acceptable for Charlie Hebdo to publish cartoons of the Prophet Mohammed, 14% unacceptable. In the aftermath of the attack, 63% think that other newspapers should have reprinted the cartoons, 71% that the media in general have an obligation to show controversial items that might offend people if they are newsworthy. Moving back onto party politics, YouGov asked about the two issues that dominated the first few days of campaigning last week – the economy and the NHS – along with expectations and preferences for the result. A majority of people (58%) think that the pledges and promises that Labour have made mean they would end up having to increase taxes on people like them. However, people feel almost the same about the pledges and promises made by the Conservative party – 51% think they would end up having to increase taxes for people like them. Overall 37% think George Osborne has been a good Chancellor, 44% a bad one – a net rating of minus 7. This actually compares relatively well to people’s recollections of past Chancellors – Alistair Darling scores minus 19, Gordon Brown minus 18, Ken Clarke minus 8 and minus 19 for Norman Lamont. Labour maintain their normal lead on the party most trusted to deliver NHS services – 31% would trust a Labour government under Ed Miliband more, 22% a Conservative government under David Cameron (there was a ComRes poll late last year that showed David Cameron more trusted than Ed Miliband on the NHS, which caused some comment. I think that’s probably just a salutory lesson of not paying too much attention to single polls with unusual results – the overwhelming majority of polls on the NHS show Labour are more trusted on it even if you do mention David Cameron and Ed Miliband in the question. Asked about their own experience of GP services, 15% say their local GP service has got better, 34% worse, 40% that is has stayed about the same. 49% of people say they are normally able to get an appointment when they need one, 36% that they are often unable to. 8% say they have had to go to A&E when they were unable to get a GP appointment. Long waits at Accident & Emergency are mostly blamed on people turning up with minor ailments, rather than funding shortages from this or the previous government. 54% blame people turning up with minor problems, 29% blame immigration and health tourism, 28% not enough social care and 27% lack of GP out of hours service. Looking towards the next election people are split down on the middle on their preferences – 38% would prefer the Conservatives to have the most seats, 38% for Labour to have the most seats. 52% would like one of the parties to win an overall majority, 24% would prefer a hung Parliament. Asked what they think the result will actually be, 59% expect a hung Parliament, only 18% expect a majority government. The Conservatives are seen as slightly more likely than Labour to be the largest party, 42% to 35%. Asked a more detailed question about coalition preferences, Tory voters would prefer another deal with the Lib Dems to one with UKIP (48% to 37%). Labour voters would prefer a Lib Dem deal to one with the SNP or UKIP (42% Lib Dem, 29% SNP, 12% UKIP). 33% of people think that Theresa May is doing well as Home Secretary, 41% badly (so her net score of minus 8 is slightly better than Cameron’s minus 13). Asked about the balance between protecting human rights and privacy and introducing anti-terrorism measures 37% think May should go further with anti-terrorism powers, 18% that she has gone too far and damaged human rights and privacy, 19% that she has the balance about right. Going through a list of the latest proposals there is support for all the new anti-terrorism measures, with most getting over 50% support. The few that do not (such as banning ransoms and extending TPIMs) are down to people saying don’t know rather than opposing the moves, there is still more support than opposition. Moving onto the issue of immigration, Nigel Farage continues to lead the other party leaders on the issue (Farage 21%, Cameron 18%, Miliband 12%… but 46% none of them or don’t know). On balance people think that EU immigration into Britain is bad for the country by 46% to 29%. However on balance people also think that we should accept it by 45% to 30% (30% think that it is bad and the government should break EU rules to limit it, 16% that it is bad but we need to follow the rules, 29% that it is good for the country and we should accept it). There would be widespread support for attempts to limit the right of EU migrants to claim benefits in Britain. 78% would support a block on out of work benefits for migrants who have been in Britain for less than 2 years, 72% would support a block on in work benefits. On balance 37% of people think that private schools are good for Britain, 48% think they are bad for Britain. Relatively few (19%) would actually support banning private schools, but on tax breaks people would happily go further than Labour have proposed – 27% would support a Labour style conditional withdrawal of tax breaks, but 46% think all private schools should lose their tax breaks anyway. The “class war” criticism of Labour’s private schools policy doesn’t seem to hold much water. Only 28% of people think Labour’s proposals are based on negative reasons and a desire to punish the wealthy. 45% think they have made the proposals for positive reasons. A large majority of people (74%) would support moving to a wholly (43%) or partially (31%) elected House of Lords – pretty much unchanged from when YouGov last asked in 2012. Asked about how members of the Lords are paid, 15% think they should receive a salary, 51% that they should be paid for the specific hours and resources that they use, 18% that they should receive no payment, allowances or expenses at all. Just 7% support the current system of a daily allowance. People who consider themselves as middle class think that the Conservatives best represent people of their class, people who consider themselves to be working class think that Labour best represent their class. 70% of people think that most politicians look down upon ordinary people. This seem to be especially the case with David Cameron – 63% think he looks down on ordinary people, compared to 46% for Ed Miliband, 49% for Nick Clegg and 41% for Nigel Farage. Asked specifically about Emily Thornberry’s tweet from Rochester, 47% of people think she was being snobby, 26% think she was not. The weekly YouGov/Sunday Times poll is up here. Topline voting intention figures are a very normal CON 33%, LAB 37%, LDEM 8%, UKIP 14%. The rest of the poll dealt with Europe, Coulson and Iraq. Dealing with Europe first, by 40% to 14% people thought Cameron was right to oppose Juncker, 46% of people said don’t know. On the other hand, 36% of people said it has probably damaged Britain’s ability to negotiate in Europe, 7% say it has probably helped. Note the fieldwork was done before the summit. On Coulson YouGov asked how seriously people took Cameron’s error in appointing Coulson. 34% said it was a very serious error, 36% a fairly serious error, but no worse than many others made by politicians, 21% not seriously at all. Looking at the crossbreaks though is a salient reminder of why things like this don’t really make much difference to voting intentions – people see them through the prism of their pre-existing political views. 59% of Labour voters saw the appointment of Coulson as a very serious error, only 6% dismissed it as not being serious. 48% of Tory voters dismissed it as nothing serious, only 9% thought it was a very serious error. On the wider issues around phone hacking, by 53% to 33% people think the thorough investigation was worthwhile and 69% think the CPS was right to attempt the prosecution of Rebekah Brooks and let the jury decide, despite her ultimate acquittal. People are pretty evenly split over whether the investigations and prosecutions will make journalists behave better in the future – 44% think they will, 47% think they won’t. Turning to Iraq, public opinion remains extremely negative towards Britain’s role in the Iraq war and its consequences. 59% think Britain and the USA were wrong to take military action against Iraq, 62% think it has increased the risk of terrorist attack against Britain, 48% think it’s made the world less safe and 40% think it has made the ordinary lives of Iraqis worse. 67% of people think that British “jihadists” going to Syria or Iraq to fight do pose a risk when they return to Britain, 17% think the risk has been exaggerated. 63% think Muslim community leaders in Britain should do more to prevent it, 61% think social media sites should do more to remove jihadists recruiting material. There was also a Survation poll in the Mail on Sunday with fieldwork conducted on Friday (tabs here). Topline figures there were CON 27%(nc), LAB 36%(+4), LDEM 7%(-2), UKIP 22%(-1). The rest of the poll dealt mostly with Juncker, and again opinions are split largely along existing party lines – so 38% saw Cameron’s opposition to Juncker as a sign of strength, 36% as a sign of weakness… but 75% of Tories thought it was a sign of strength, 57% of Labour voters thought it was a sign of weakness.